Part Number WH41X10096 replaces: 1026050, AP3419523, J85-639, WH41X0367, WH41X10096, WH41X367. The drain hose is black in color and made of flexible material. This is a part for your top-load washer. The hose measures 57 inches long. This part moves the water out of the washer and into the drain. If this parts cracks or becomes damaged it will leak during the drain cycle of your wash and you may find water on the floor. To access the hose, you will need to move the washer away from the wall to get to the back of the appliance. There will be two screws holding it in place that will need to be removed. Hello Tresa, thank you for your question. The Drain Hose Clip Part Number: PS270508 holds the drain hose into place at the back of the unit towards the bottom. The drain hose then comes up and goes into the drain port in your home to allow the water to drain our of the unit, up through the hose and into the drain in your home. 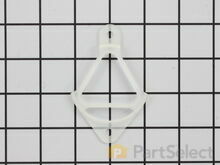 Anti-Siphon Clip Part Number: PS271098 is used to hold the top of the drain hose into place at the drain port. I hope this helps! Hello Brenda, Thank you for contacting us. Very sorry but Ia m not clean on the question. 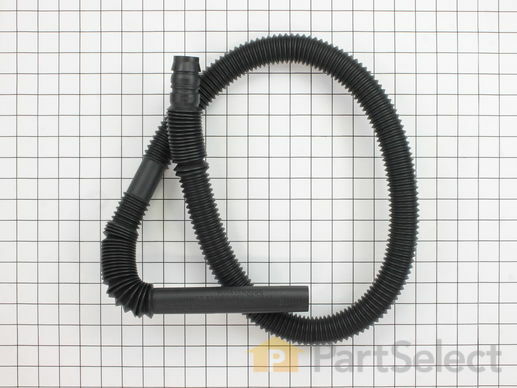 I can tell you the drain hose we list for this model number is PartSelect Number: PS890597 and is 57 inches in length. Please submit a new question if you have any follow ups. Will this hose work with a Bosch washer? Hello Betty, thank you for contacting us, In order for us to locate the correct parts and repair information we will require the model number of the unit. Once you have located the model number please feel free to resubmit the question and we will be happy to help you. Look forward to hearing from you! Hello John, thank you for your question. I believe you're looking for PartSelect Number PS272192. Please enter the part number into the site for current price and availability. Good luck with your repair! Ordered this direct replacement part on a Thursday and received it that Saturday. Parts diagram was easy to use as well. Part arrived on time and works perfectly. The ease to locate the part on-line made it easy to order and quickly received to facilitate a timely repair replacement.